I first spied this skirt on the cover of a magazine when I was in the checkout line at the grocery store. While trying to put all of my items on the conveyor belt, I frantically flipped through the pages to see who it was by and where to buy it. After I found out it was from Plenty by Tracy Reese (who has actually been one of my favorite designers since college) I tracked it down on her website, only to find that it was sold out. I had a feeling this would be the case. 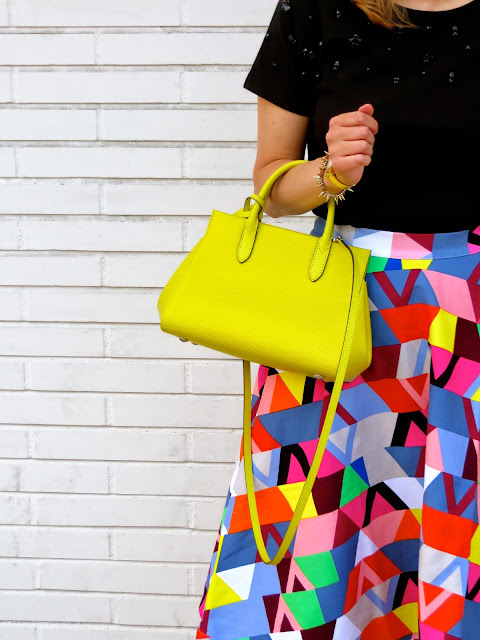 Who wouldn't want a skirt with a cool geometric print in a Crayola box of colors? So imagine my delight when browsing through the "new arrival" section of Anthropologie and finding the same skirt, dubbed the Geoprism skirt. I snatched it up right before it sold out during the Anthro Mother's Day sale with an extra 20% off. This is one of those pieces that pleasantly surprises you when you get it in the mail and discover that it's even more beautiful in person. Now the only problem is deciding what to wear with it because the colors lend themselves to so many options! Lovely ensemble! The skirt is absolutely gorgeous!!!!! Thank you! 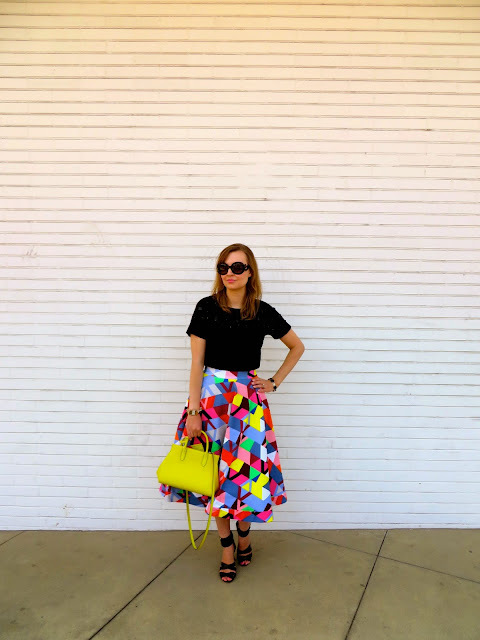 This skirt is definitely going to get a lot of wear this summer! 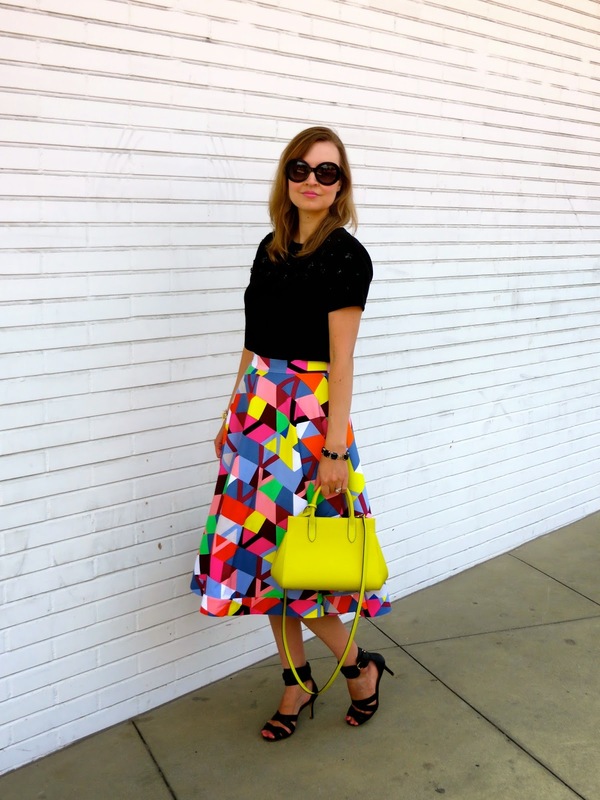 Fantastic skirt, so bright and joyous! Love your glasses, too - cool! Yes, the bright colors really do brighten your mood! Thanks for stopping by! amazing pattern! love the skirt! Thank you Irene! 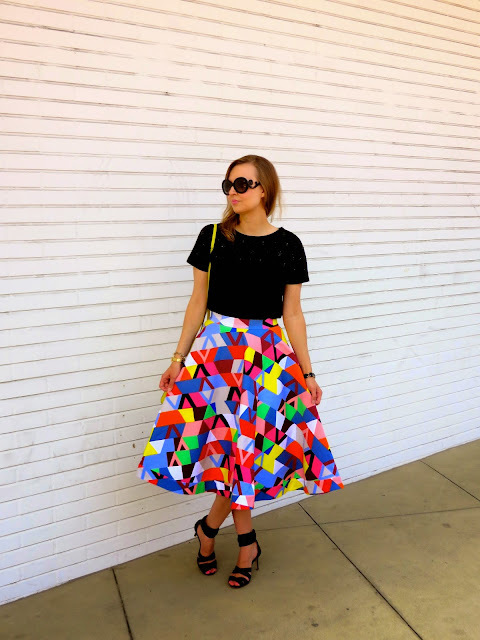 I also adore the pattern of this skirt! It's almost like a quilt. Thank you! Yes, the skirt definitely is very psychedelic. I never thought about it that way before! That is a wonderful skirt. The colors are great. You can wear it with so many things. Yes, it is very versatile due to all of the colors. I am already looking forward to how to style it next! You and I have similar tastes! I would wear this in a heartbeat with all of the colors, Love your Epi of course, and then the skirt taking center stage. Love it!! 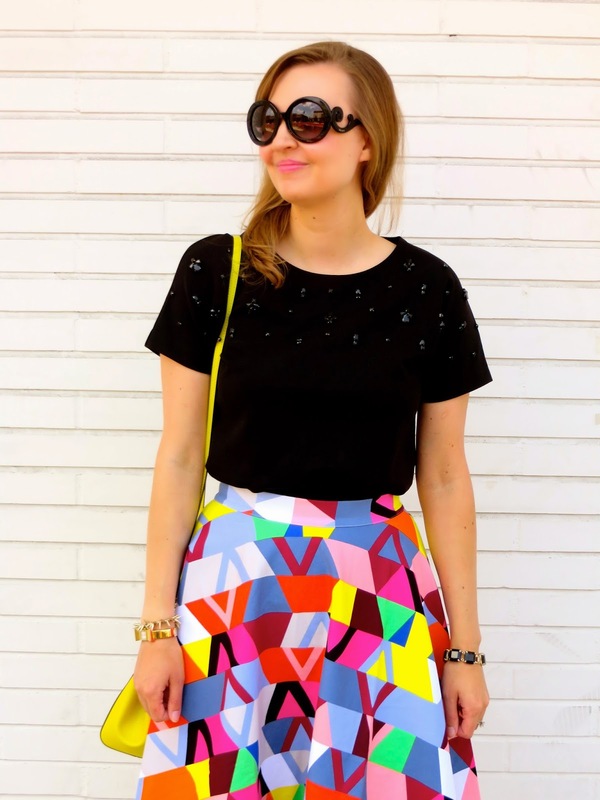 I can definitely see you in this skirt! I think we both gravitate towards similar colors and styles. Thanks for hosting the link up this week! 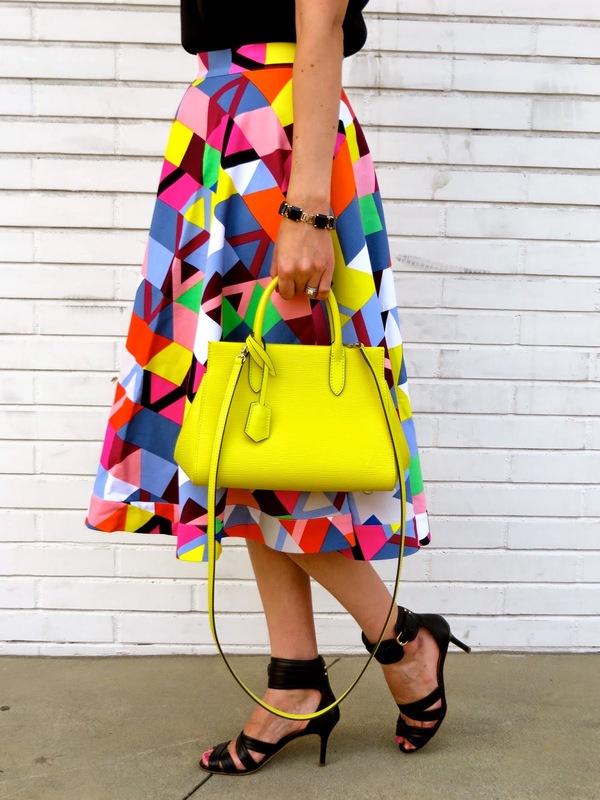 the skirt and bag are perfect together! Thank you! 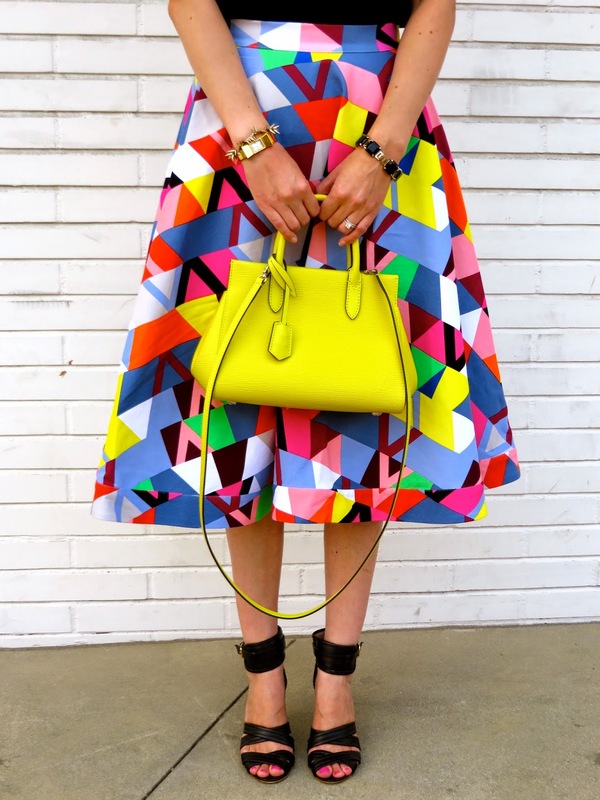 You are so right that this bag and skirt were made for each other! I wanted that skirt! It looks wonderful! Thanks! I think the skirt is now back in stock in some sizes on the Anthro website. Definitely check it out! i love that fun and funky skirt!